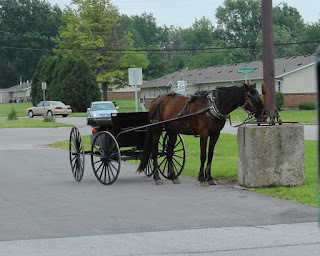 As we travel from the prairie into the northeast, Jan and I see a number of Amish farms and horse and buggies. We note a number of Mennonite families(referring to the order that allows more modern conveniences) camping in the Ohio parks. 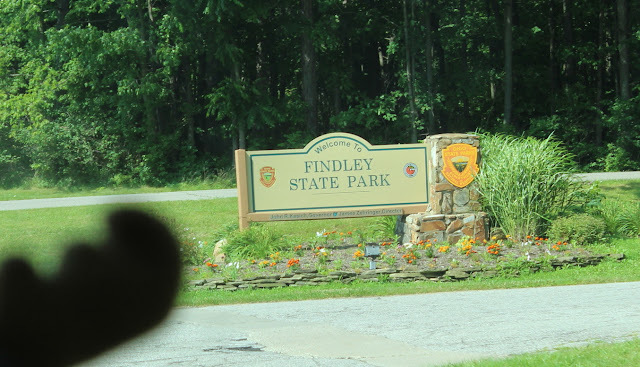 From Findley State Park in Wellington, Ohio, we drop back down to Route 224 and head east. After skirting Akron, we are still on 224 which brings us to Mill Creek Corps of Engineering Campgorund in Berlin Center. 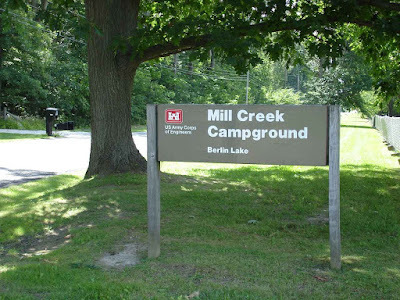 Mill Creek is a large Corps park, some 348 sites. We had been here before in 2013 and still find it a wonderful park to visit. 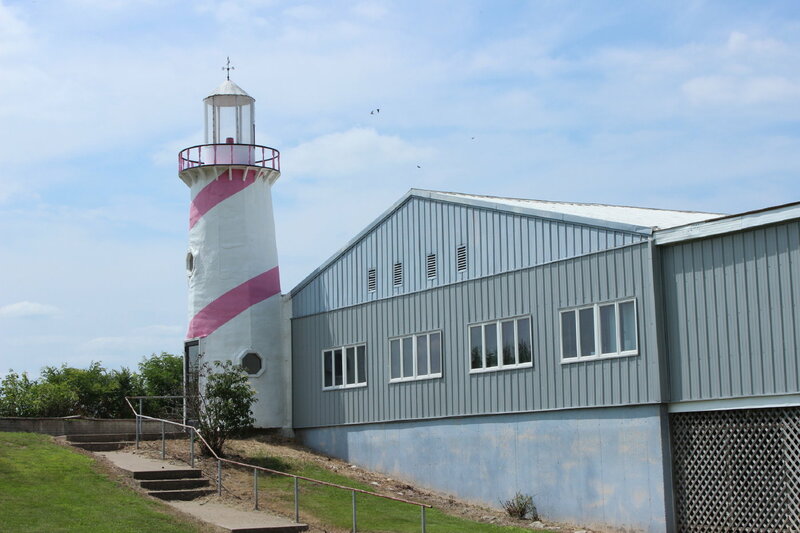 We note that the non-electric sites are much more private and also more available on weekends. 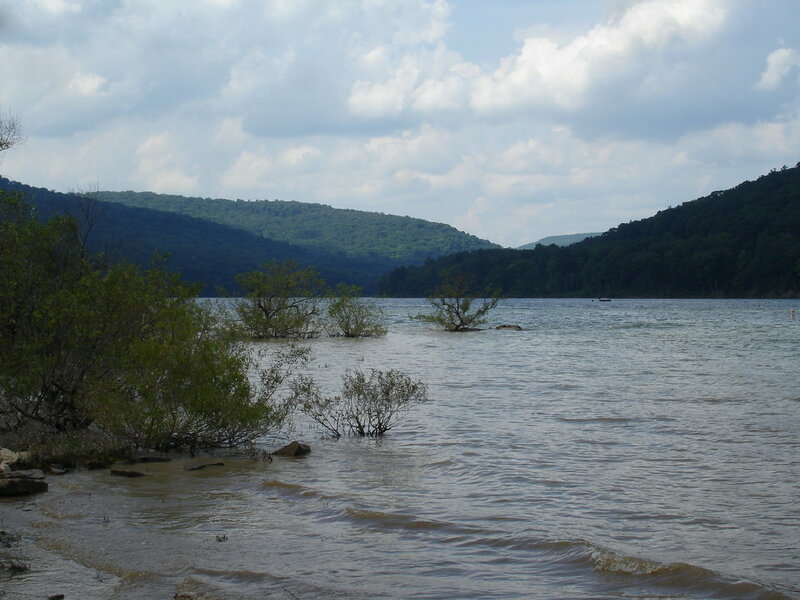 From Mill Creek we continue on Route 224 south of Youngstown, Ohio and into Pennsylvania. It seemed on the map to be a quiet road, but it turned out to be a very busy section with mile after mile of shopping centers. We saw stores we haven't seen in over a year!!! Did we stop?? NO! Just over the line we find Route 376 north and follow that to Route 18 north to Hermitage, Pa. 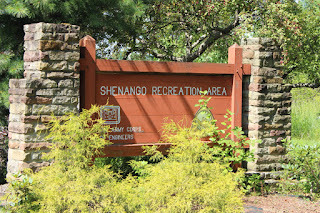 Here we stop at Shenango Recreation Area. This is a new COE park for us. 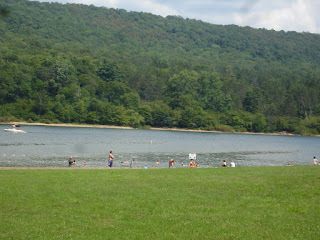 It is quite pleasant with a large number of families enjoying the water and camping. It is also a park where we saw more groundhogs then we have seen anywhere else. 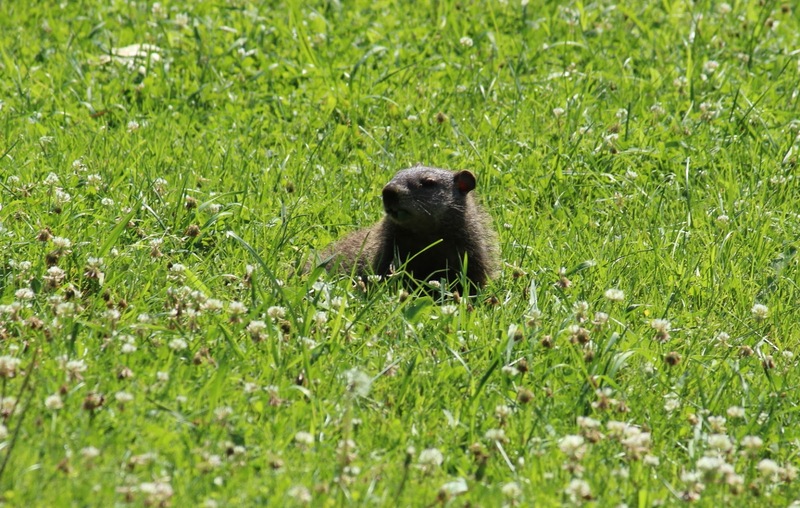 We did see a number of prairie dogs in the west , but not groundhogs. And maybe this one is a relative of Bob's, Lucas. What do you think??? Now that we are into Pennsylvania, we decide to try and stay on US highways and state roads. Not interstates. There is a nice quiet road from Shenango to Tionesta Corps park. Route 62. 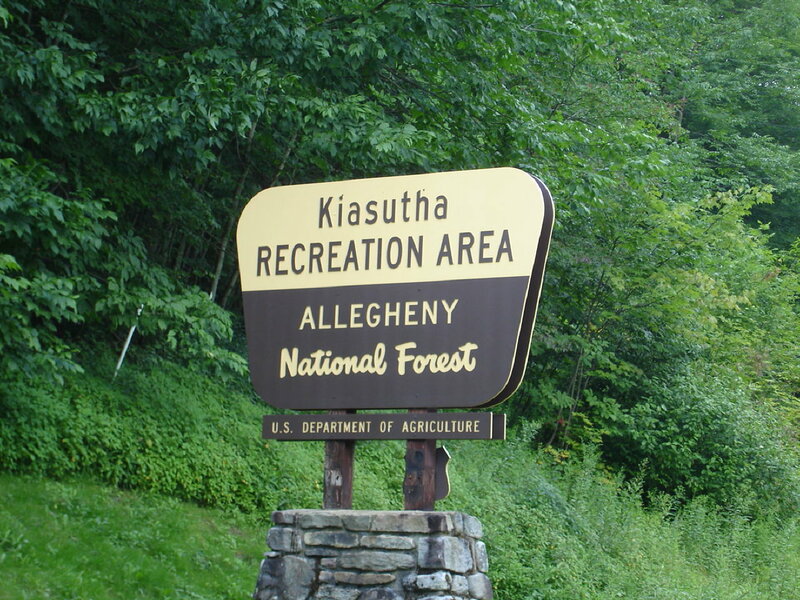 This is on Tionesta Creek which is at the southwest section of the Allegheny National Forest. Suddenly, it seems, we are into hills and mountains!! What a change from Nebraska, Kansas, Missouri,Iowa, Illinois,Indiana, and Ohio. 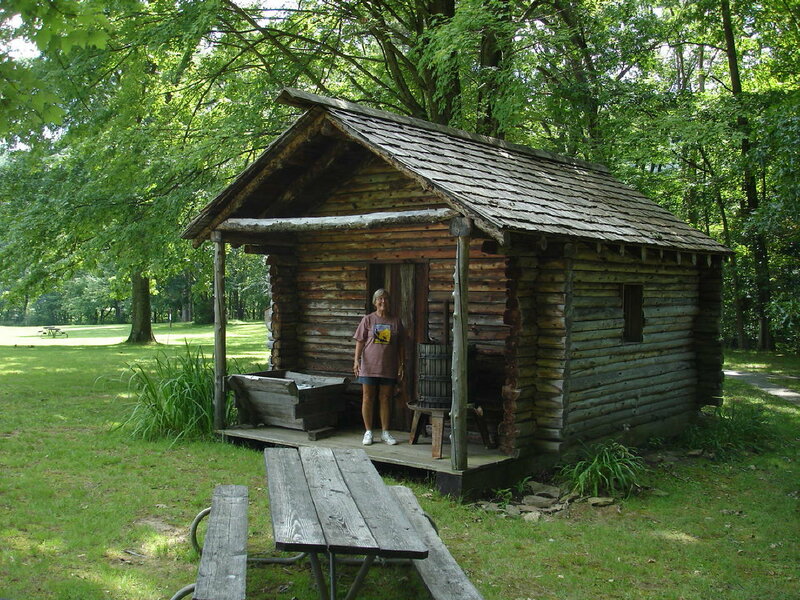 Jan says this could be her next home. ??? Looking down at one of the campground loops from the dam. Sometimes you don't want to think too hard about living at the foot of a dam. It certainly seemed quite secure---------though they did have a lot of rain recently? 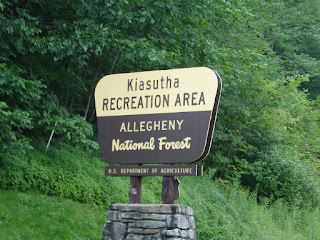 From the town of Tionesta we follow Route 62 north right along the Allegheny River. This is a pretty drive, but the road did have some sections that were extremely rough. Luckily not too long a section. 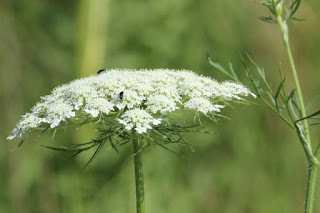 Reaching Route 6( yes, the same Route 6 that used to start in Long Beach, California and runs to Provincetown, Massachussetts), we head east on a better surface to Kane and then north on Route 321 to Kiasutha National Forest Campground. On a very hot day, not as many boaters as you would expect. This campground is new to us. About 2 miles away is Red Bridge Campground where we have stayed twice before. 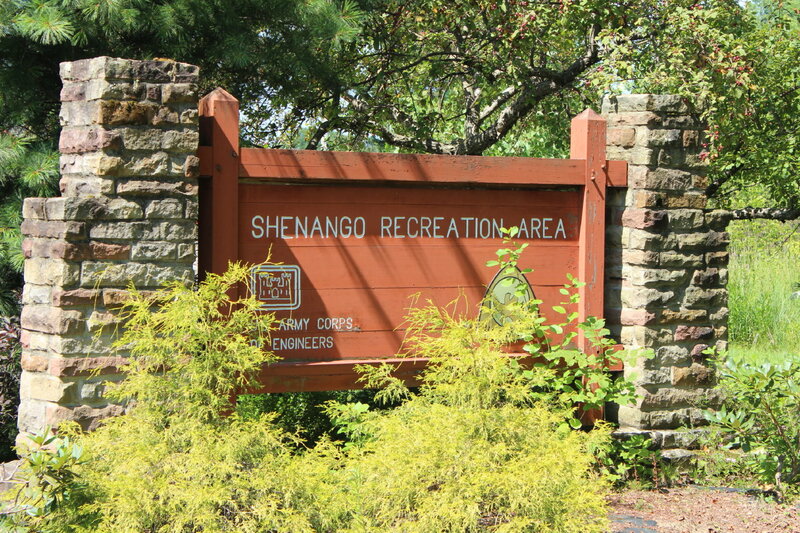 Both campgrounds are well maintained with good sites. 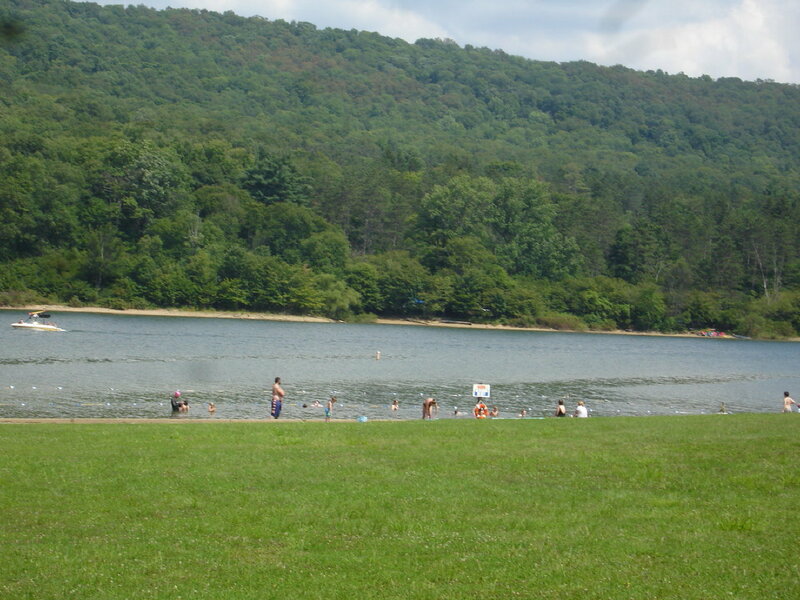 This campground features a larger beach with a good sized bath house for changing as well as a number of tables. 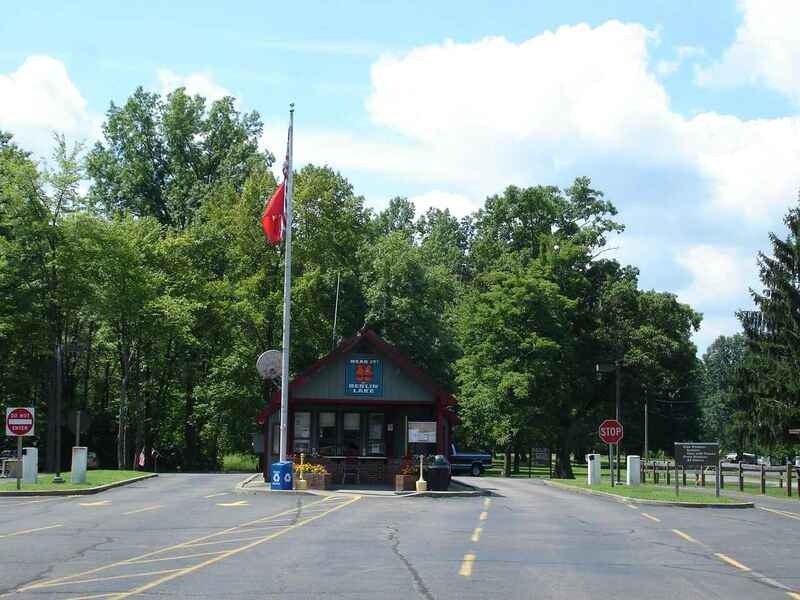 The next stop is another favorite, Ives Run Corps of Engineer in Tioga, Pa. It is a simple route, following Route 6 east to Route 287. Jan is enjoying the view from our side windows.The water level at Hammond Lake is very high this year. We are remembering some previous visits where the water level was quite low. We are going the comfortable route. Even though we have those great solar panels, we really are enjoying the air conditioning which requires a land line or the generator for electricity. 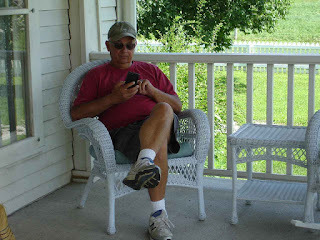 Since it is quite hot, the land line is the reasonable and quieter choice. Very comfortable while the outside temperatures are climbing into the 90's with high humidity. And yes, New England, this hot and humid weather is headed your way. 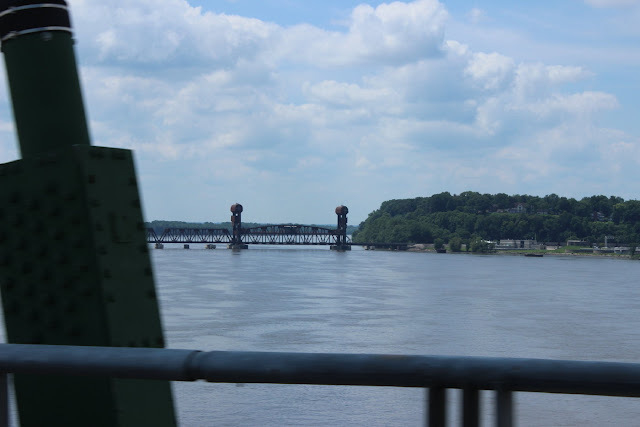 A bit different on this section of the Mississippi in Keithsburg, Illinois. Besides the large combined barge traffic, there is a significant use of private boats for fishing and cruising. There is some limitation with locks on the river, but still a lot of water. On this weekend , the town sponsored a live concert in the town park. The group was quite talented(in their 30's and 40's?) playing a lot of older titles like "Sweet Home Alabama"(good cover) and others for about six plus hours. People gathered round in golf carts, folding chairs, and parking their boats on the shore of the Mississippi to listen. 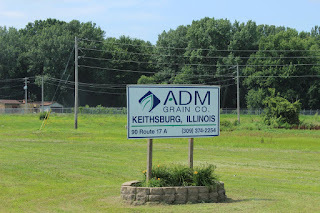 From Keithsburg, we head south on Route 25 to 164 to 67 to 136 east to Le Roy and Moraine View State Recreation Area. These are all state roads . county roads, and US highways. 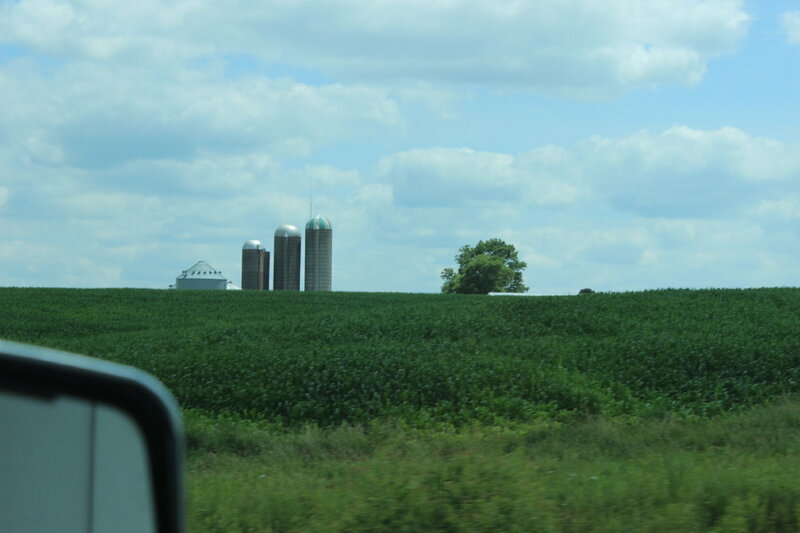 All along the way are large fields of very tall corn. Some other crops as well. 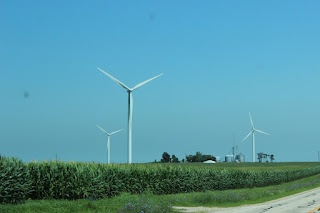 Interesting views through the farmland include wind turbines as well as crops and silos. 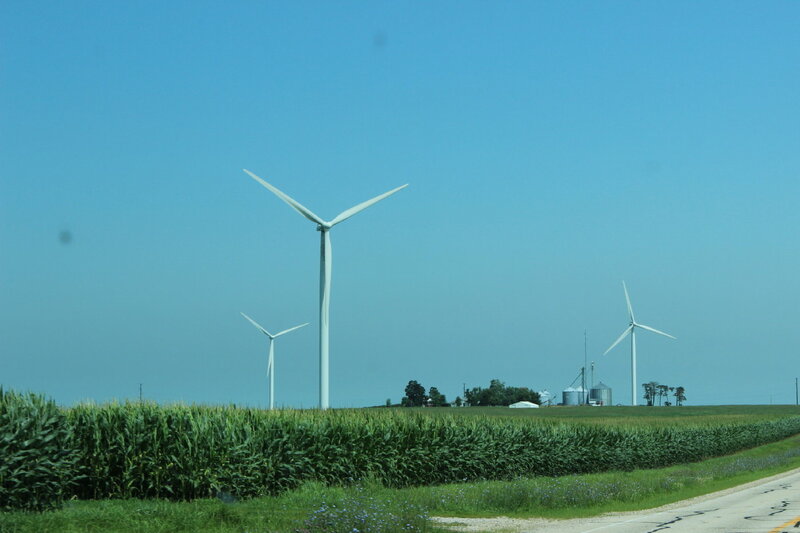 Some crests of land might have 50 or more turbines with a sign for windfarms along the way. 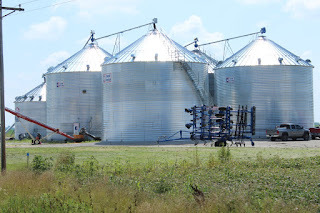 Now and then , besides grain elevators on private farms, there will be a large collection of storage buildings in a town. In this case owned by farmer co-operatives and large private companies. You get an idea of the size of these storage elevators with the cars in front. 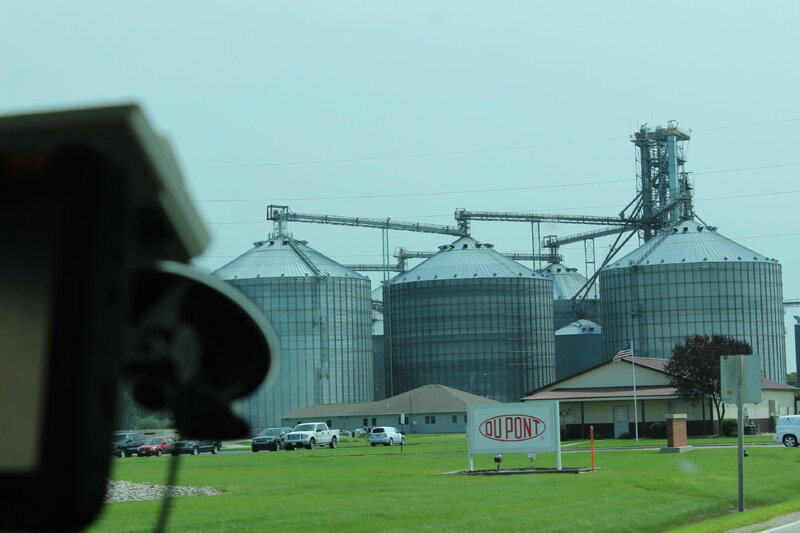 The Dupont sign is for agricultural chemicals also stored here. Trailer trucks line up to deliver grain to the towers and there are always train tracks to service the elevators. 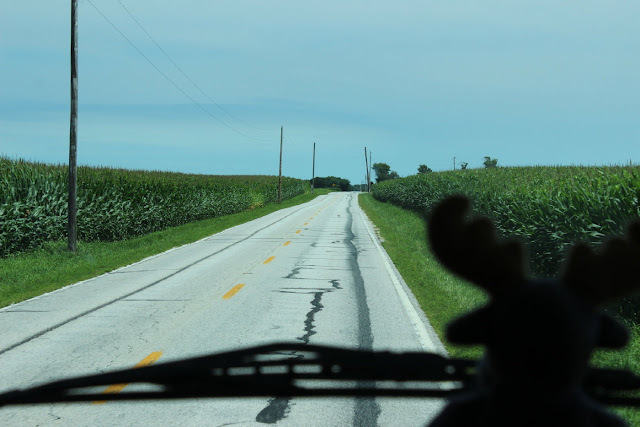 Typical driving includes narrow roads like this( at 60 mph speed limit) with tall corn on both sides. Eustis is on the lookout for deer. From Moraine, we follow Route 9 east into Indiana and Eastern Daylight Time. Route 9 becomes Route 26 which bring us to West Lafayette, Indiana. Did we mention how straight some of these highways were? It starts to change a bit with Indiana. More people, smaller farms, and larger cities----and curves. 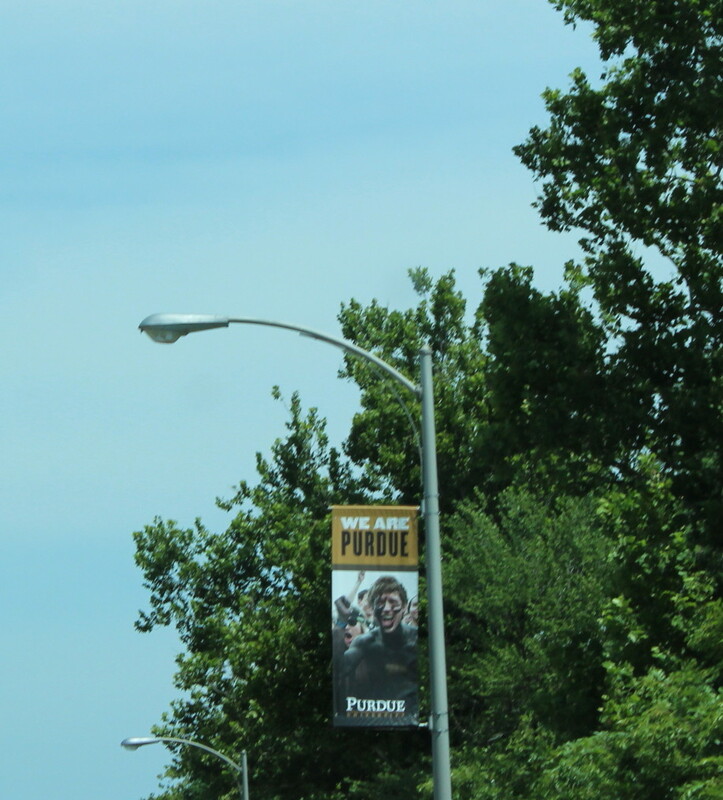 West Lafayette is the home of Purdue University. Purdue homepage. For a college that claims about 30,000 students, this town is quite neat and easy to drive through. An attractive college town. 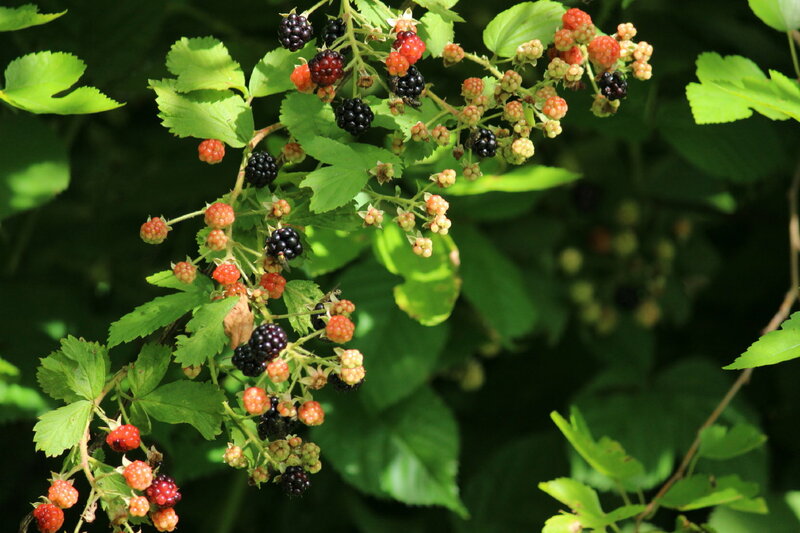 We are sure that changes come September! 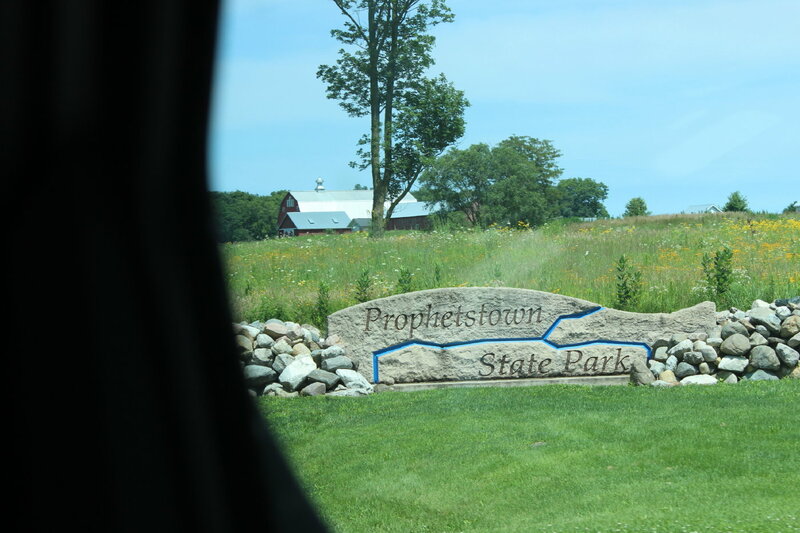 Just north of West Lafayette is Prophetstown State Park in Battle Ground. This is Indiana's newest park built in 2004. A large park with nice level campsites looking out on the prairie. It is at the junction of the Tippecanoe River where it meets the Wabash River. 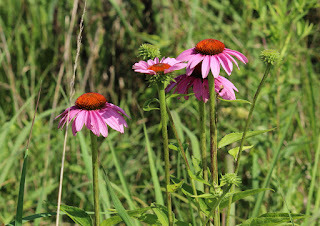 The park includes a 1920's era working farm, an aquatic center which offer all kinds of water sports but does not infringe on the park views, a nicely planned bike trail,and prairie views with wild flowers. 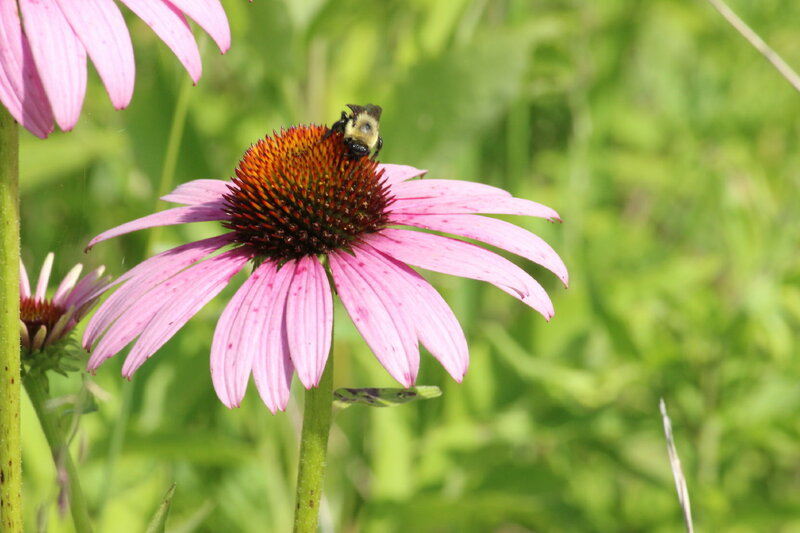 Everything from Black Eyed Susans to Cone Flowers to Queen Anne's Lace to Black Berries! The park has greenhouses where they grow flowers. 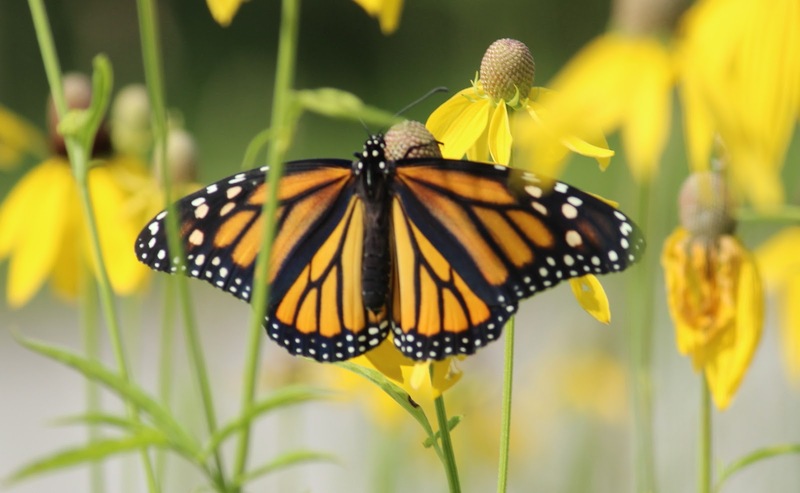 We have to believe that they purposely planted milkweed for the Monarch Butterflies and others. The farm is easily accessed from the campground. 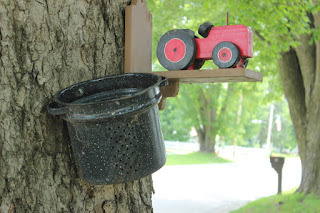 The farmhouse is well maintained and this day was hosting a happy group of 10 to 12 year olds that were baking, feeding the animals, and other activities. 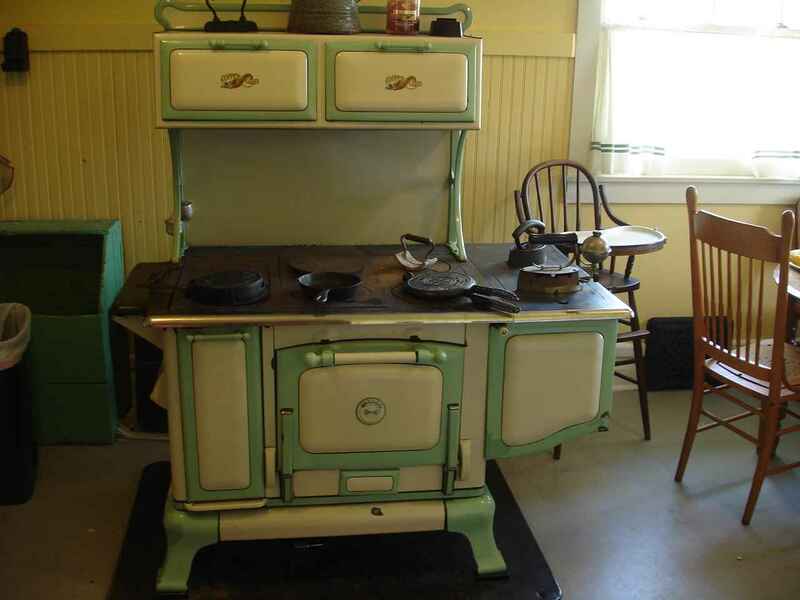 The docent working with the kids was enthusiastic about the stove. She uses it all the time. This was the first time we saw a washing machine like this one. 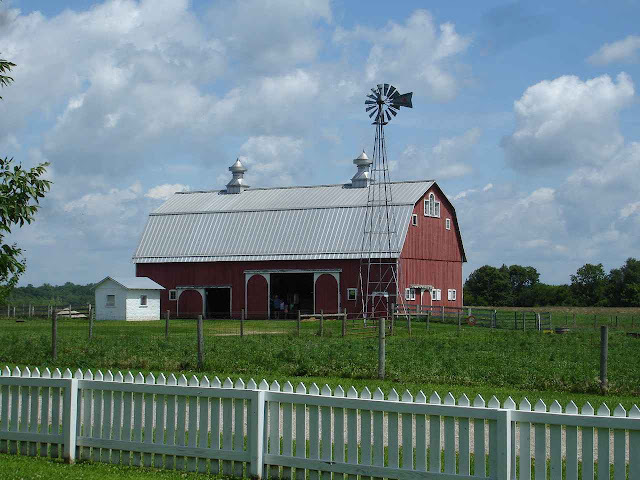 The barn was dismantled, moved and reconstructed here. Inside are the horses, a few milking cows, and lots of room for hay in the hay loft. In addition to the barn there is a good pen of pigs and a few chicken coops. 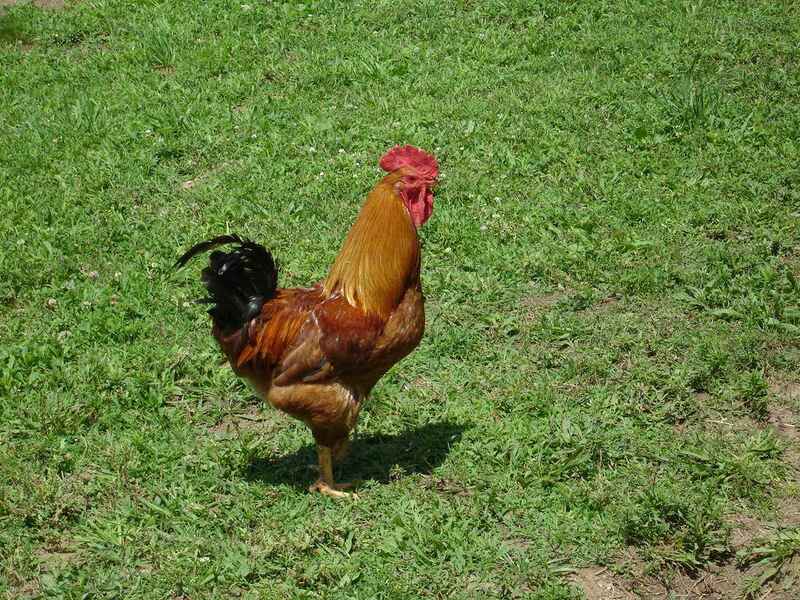 The chickens, with the rooster, roam freely during the day. The farm sells the eggs as well as beef, pork, and bakery products. The store was being renovated, but they were supposedly still selling at least the eggs and some other products. Bruce looks way too comfortable on the porch. 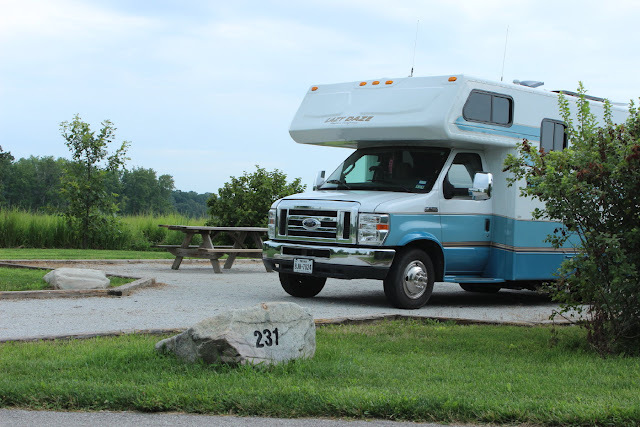 We thought some of our readers might appreciate the 231 campsite. This was the address number for Jan's folks for many years. Turned out to be a great campsite as well. 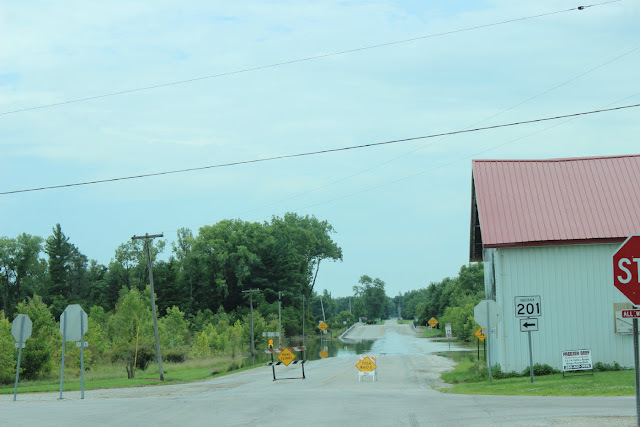 We saw a lot of signs of flooding coming through the midwest. It was more apparent for Indiana into Ohio. 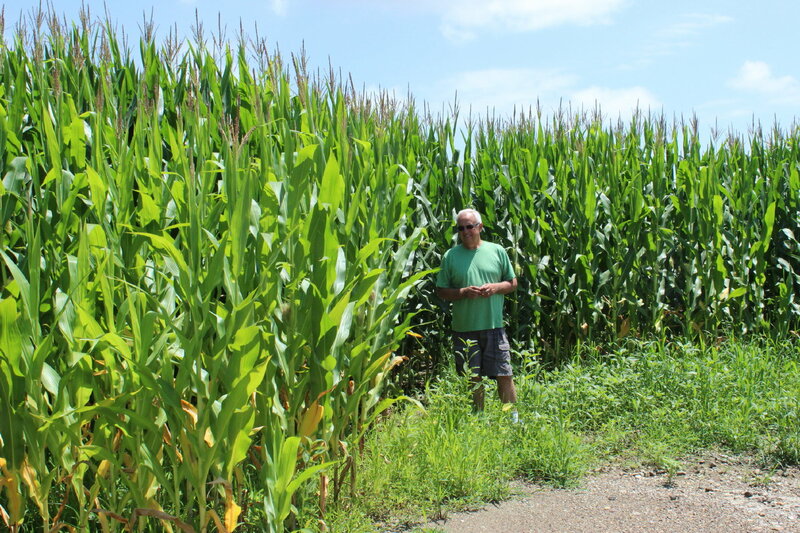 We saw many, many fields of corn and other crops that were flooded. The corn was much smaller , yellow, or just dead. Some roads were closed, like this one, for flooding. The rivers were all above their bankings. People we spoke to indicated that it was a very wet Spring that never stopped raining. 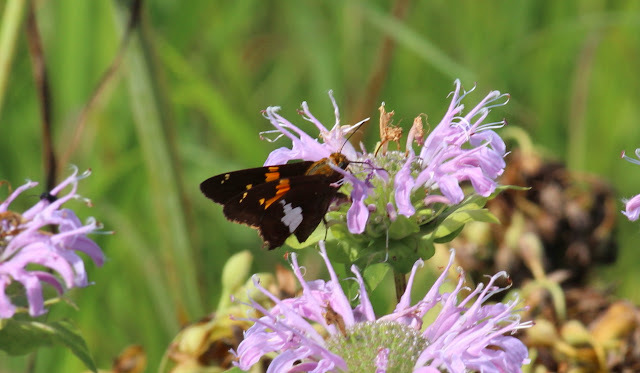 Southwest of Fort Wayne was Salamonie Lake State Park. We pulled in--did not check ahead-- and discovered that the campground was closed as a result of flooding. Oops! 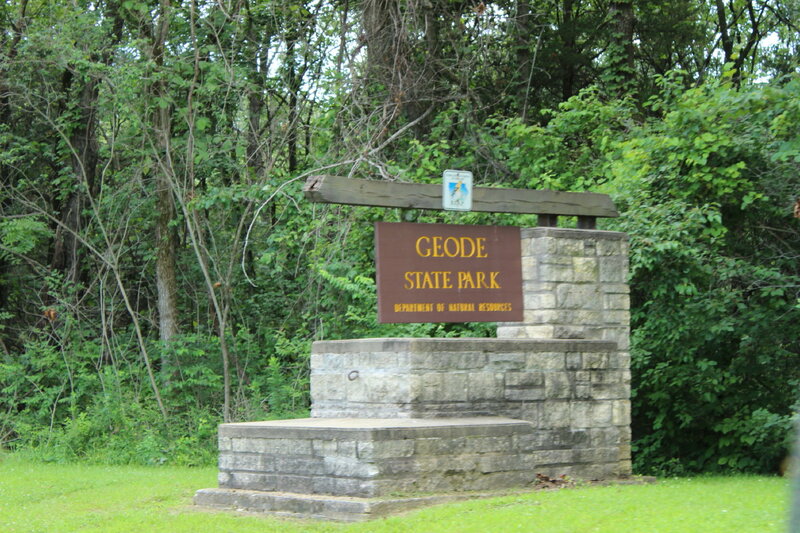 Luckily we were early and proceeded on to Ouabache State park(pronounced like Wabash) which was quite nice--------and open! We will also mention that twice, once in Missouri and once in Indiana we followed the weather rather closely. A tornado touched down in Missouri not far from our campground and also about 7 miles west of us in Prophetstown. Not a lot of places to go when you are in a RV. Luckily , we avoided the rough weather--except for very heavy rain. Jan and I rarely make reservations. We just don't know when we will be somewhere and we quite often change our minds about routes and will sometimes add a day or two at a park we enjoy. The other thing is that Lady Blue is very flexible. She will fit just about anywhere. 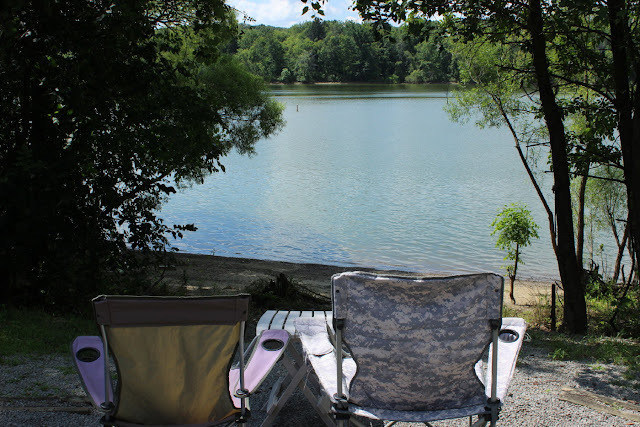 In this case, it is the weekend and all electric sites are full at Findley State Park in Wellington, Ohio. 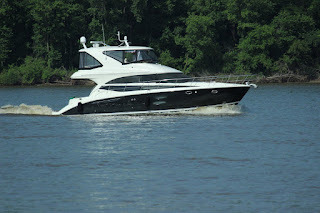 But Lady Blue has solar panels and a generator. 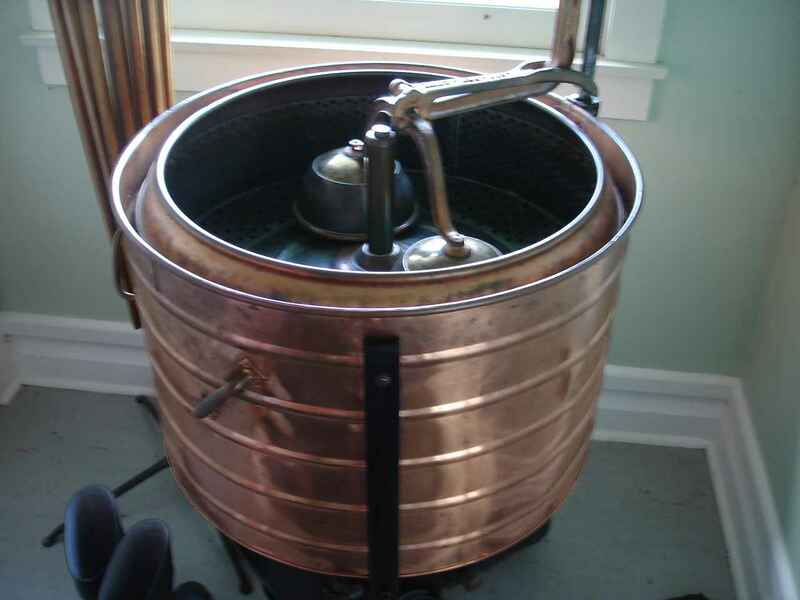 So, even though it is one of the hottest days in Ohio, we have air conditioning and everything else we need. Thank you, Lady Blue!! 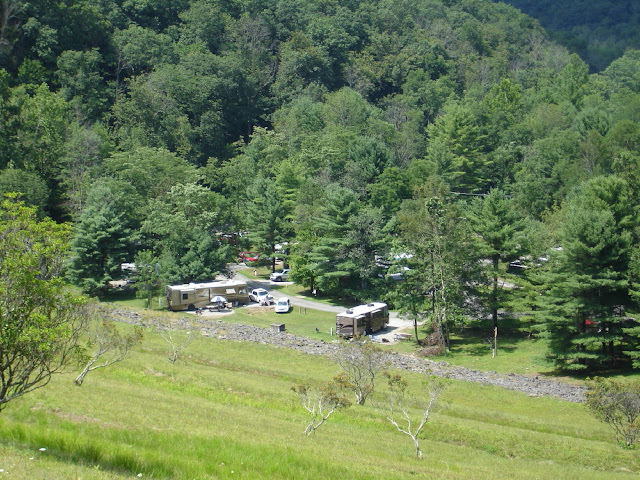 We make a point to park far away from other campers to minimize the generator annoyance. 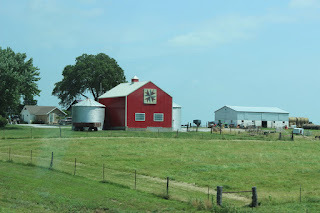 We had mentioned seeing the signs for the Eisenhower museum in Abilene, Kansas as we headed a little ways east to be sure to have a camping spot at Curtis Creek COE. 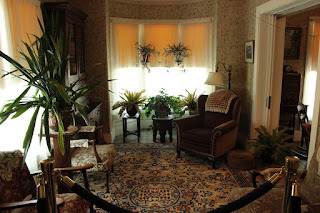 Sunday we decided to head back to Abilene and see the museum. Good decision. Jan and I are part of the post WWII era. Jan's dad served in the war under General Patton. But one of the pictures he kept from the war was of General Eisenhower when he came to visit their group. The picture to the right is of Eisenhower as Supreme Commander of the Allied Expeditionary Force visiting paratroopers before the D day launch on the evening of June 5th, 1944. Eisenhower was well liked and respected by the allies which made him a perfect choice by Roosevelt and Churchill. He did not seek to be in the limelight, but worked steadily towards ending the war. His popularity carried over to the post war era with both Democrats and Republicans seeking him to run for president. After a few years as president of Columbia University, Ike agreed to run for President of the United States as a Republican. He won by a landslide. In elementary school, both Jan and I remember the "I Like Ike" slogan. Some of Ike's accomplishments were the U.S interstate highway system, the ending of the Korean War, the 'Atoms for peace"speech to the UN General Assembly, signing a bill to begin NASA, signing the 1957 Civil Rights Act, and setting up a permanent Civil Right Commission. Born in Texas, the Eisenhowers moved back to Abilene where Ike grew up. 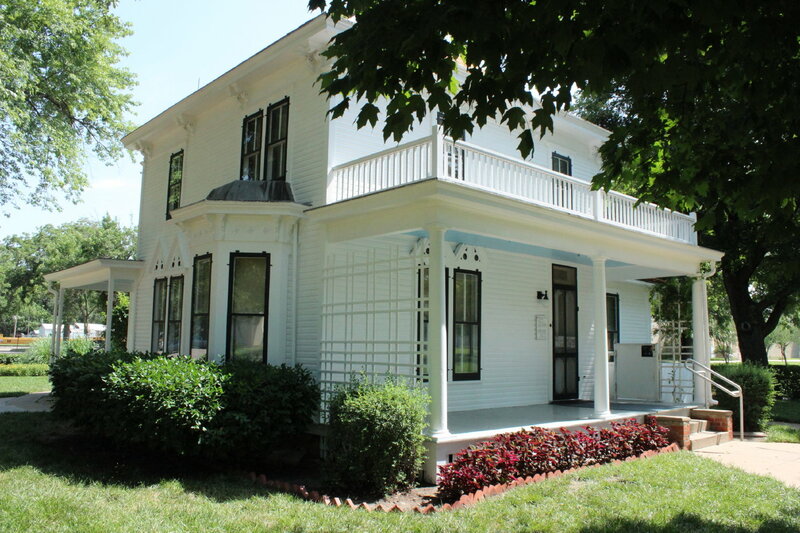 His father worked in the creamery and they bought the house above with two and a half acres for $1,000. 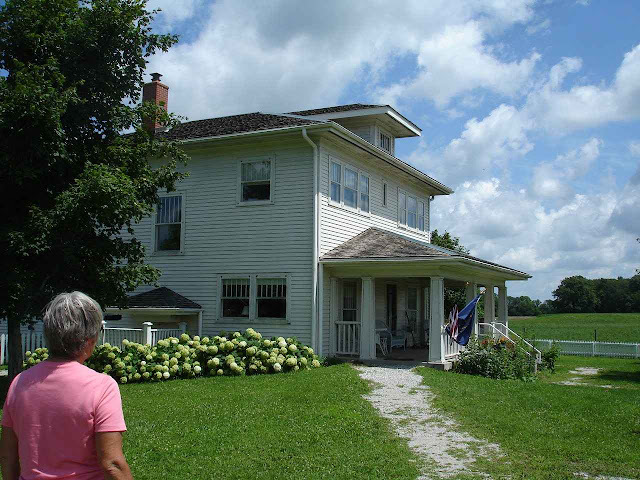 It was a comfortable house for the two parents and six brothers. Jan and I remember living rooms like theirs in the picture immediately above. That includes the lace to "protect" the furniture. Remember $1000 to buy the house? 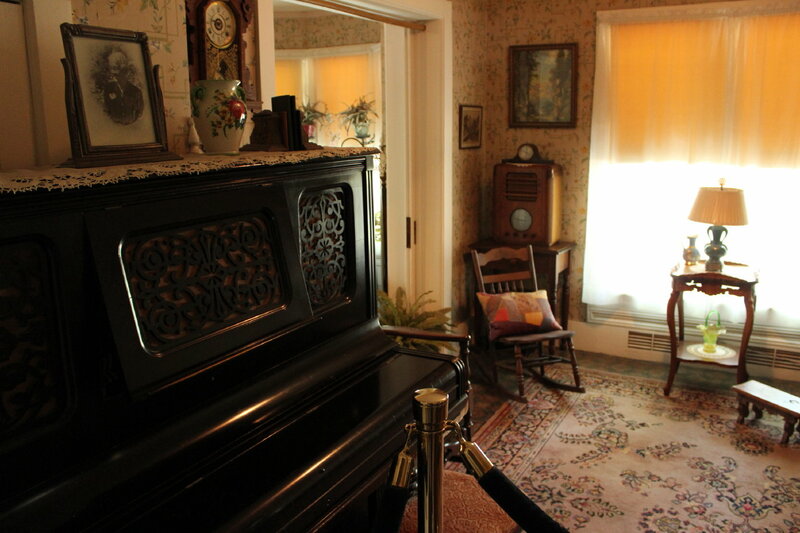 Ike's mother paid $1000 from an inheritance to have this piano shipped from Boston to Abilene. She taught all the brothers piano though Ike did not pursue the instrument. In the background is a shortwave radio that they used to listen to war broadcasts. 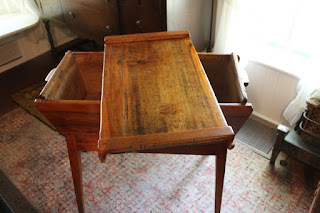 The picture above is of a breadbox used by Ike's mother . The dough was prepared on the board, the loaves rose in the box. She would make 7 loaves every other day. 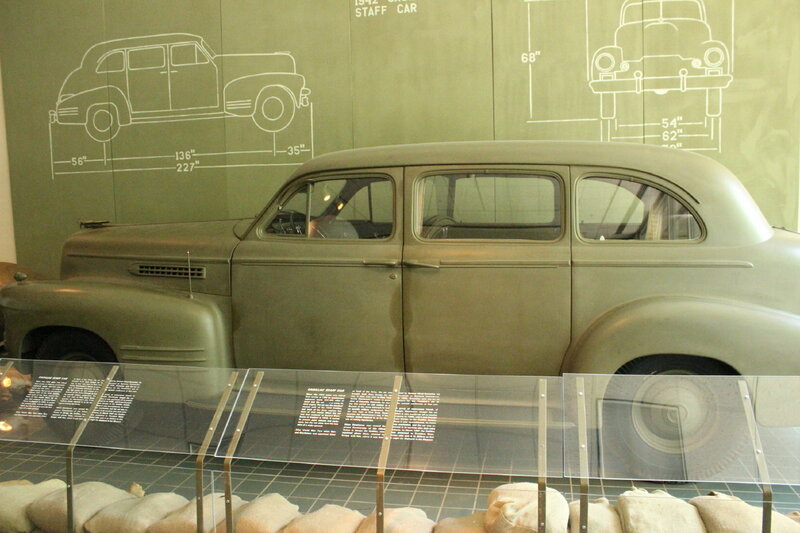 the vehicle is the 1942 Cadillac used by Eisenhower from 1942 in Europe until 1956 in the U.S. 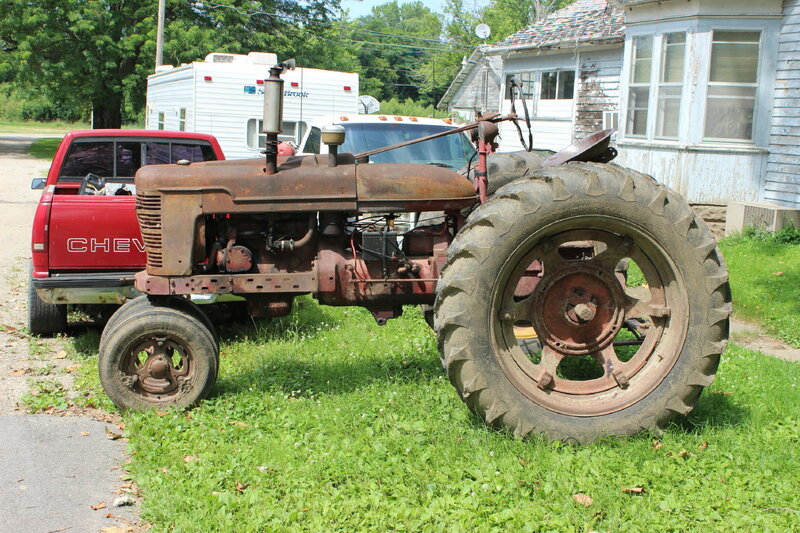 It went over 200,000 miles with three identical engines. 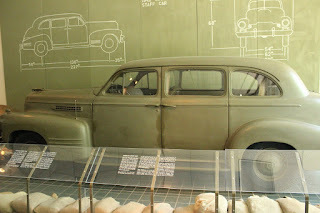 The museum is huge with a lot of information. Perhaps the most complete timeline of all the battles of World War II. Across the lawn is an equally large library. How many of you remember this picture from the end of the war? 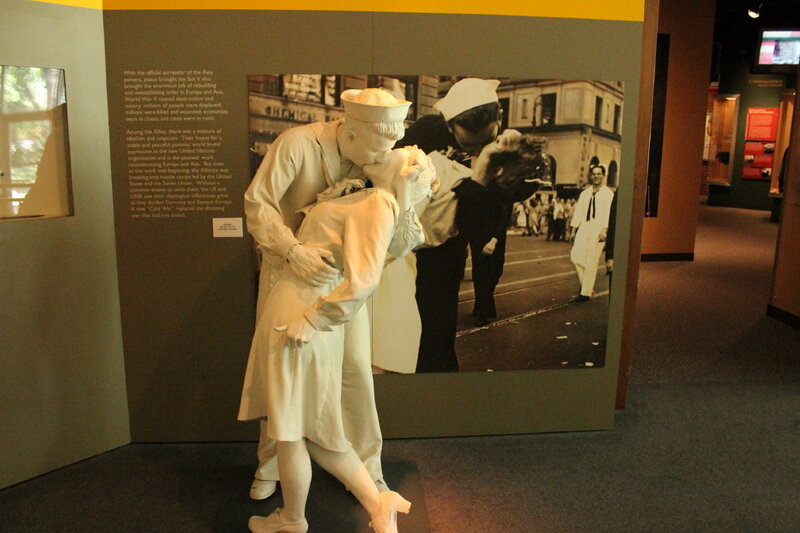 In Times Square celebrating VJ Day it is the iconic picture of the end of war. A sailor and a nurse. 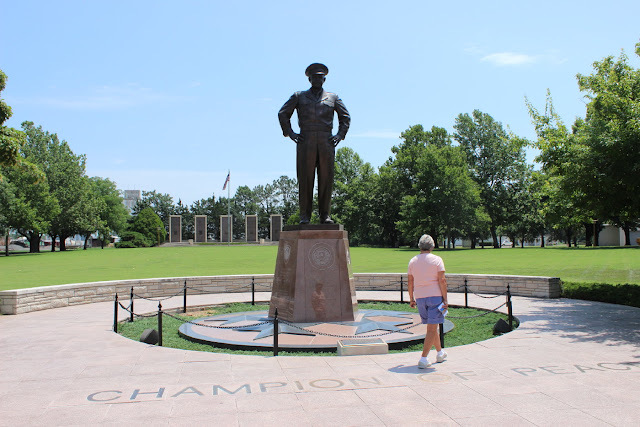 Jan is inspecting the statue of Ike. The label on the paving says "Champion of Peace". This was how Ike wanted to be remembered. After the hard decisions he had to make as the Supreme Commander in the biggest war, he worked hard to preserve peace afterwards through his presidency. These are some of rural pictures out of Kansas and into Missouri. There are many farms with acre after acre of corn and grains. 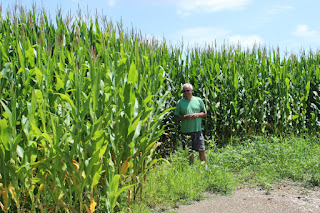 Eustis is as amazed as Jan and I at how you can look across these fields of corn and see all of the plants at the exact same height. It's like you could walk across the tassels. Above, the hay rolls are HUGE!! 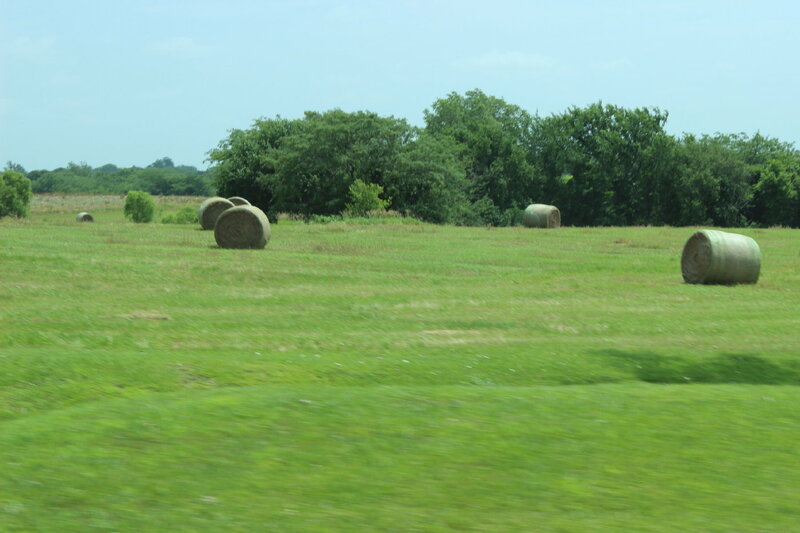 We were on Route 70 for Abilene, Kansas. 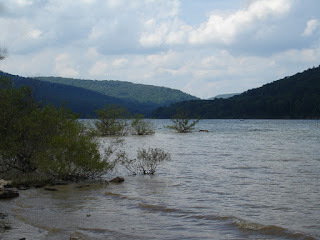 From there it was east to Perry State Park on Perry Lake. 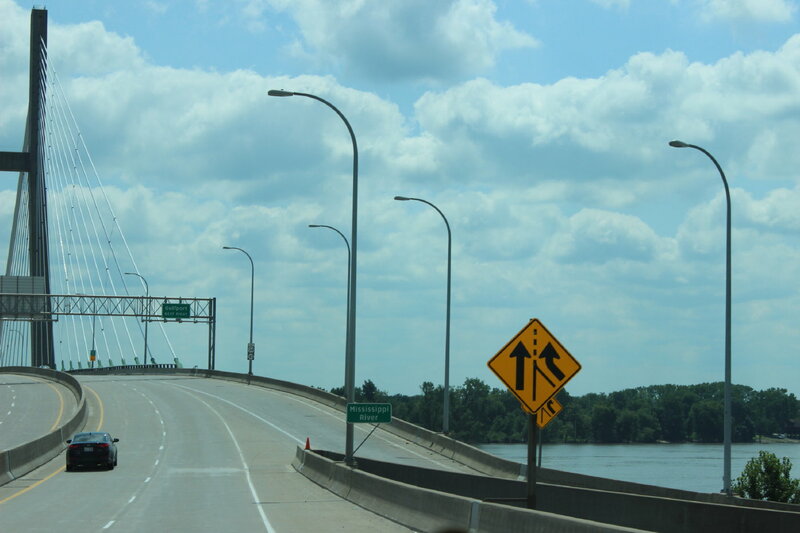 We follow Route 59 north towards St. Joseph as we crossed the Missouri River ("cross the wide Missouri"). Actually that song is "Shenandoah" about the fur traders coming down the Missouri wanting to marry the daughter of Indian Chief Shenandoah. Then there is also "The water is wide" Missouri song. 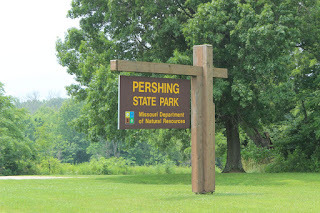 East in Missouri on route 36 to Pershing State Park( named after the famous WWI general who was born in Laclede, Missouri). 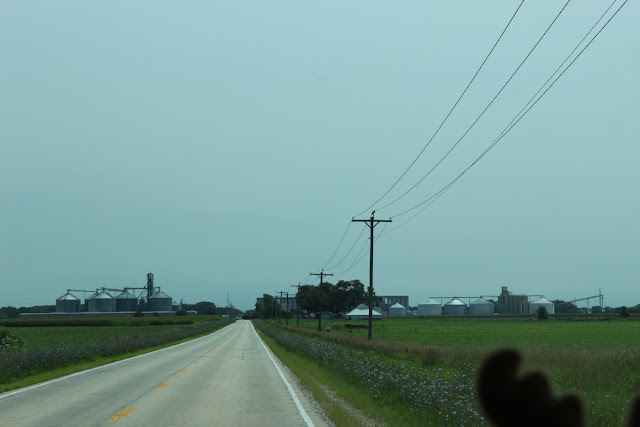 From Laclede, we turn north towards Iowa on Route 5. 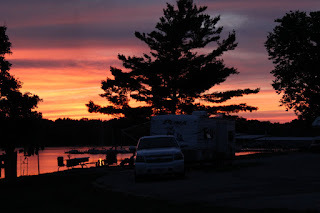 A very nice stay at Rathbun COE on Rathbun Lake Some very nice sunsets across the lake. 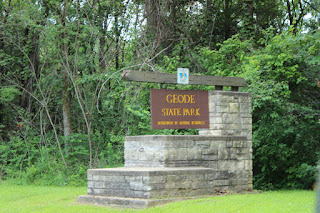 From Rathbun Lake, Jan and I head north on Route 5 to Route 34 and then east to Geode State Park. 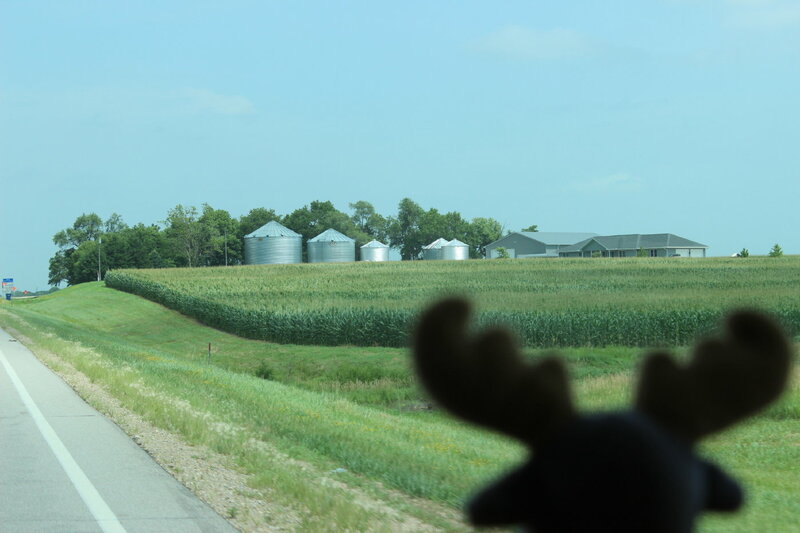 As you can see there are some huge grain elevators or storage units along the way. Many of these are owned by co-ops, but some such as the silos plus are on private farms. 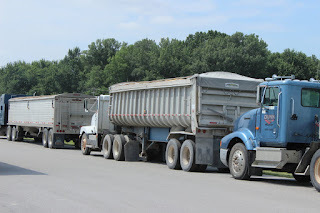 We have been trying to travel on US highways or state roads. It is much more relaxing and enjoyable, but now and then it is necessary to just travel on the interstates. 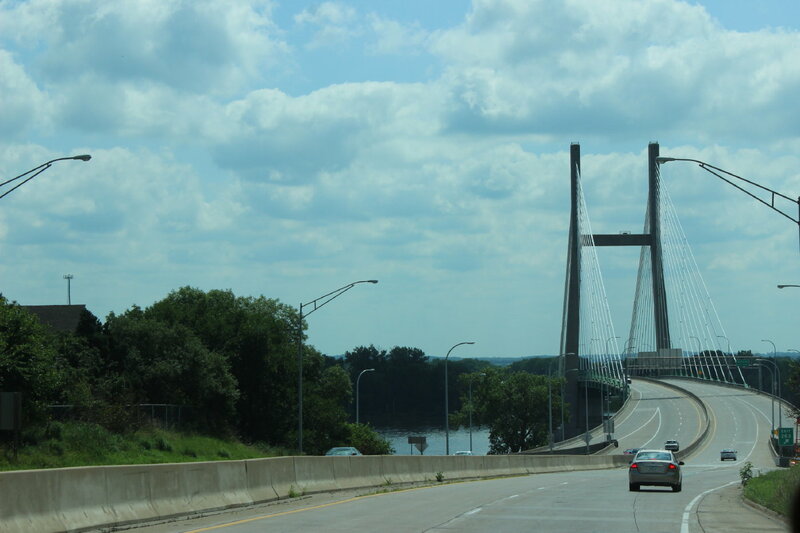 If we are moving out of Missouri and into Illinois, it must be---------the Mississippi River. Two years ago we were at the source of the Mississippi River in Itasca State Park in Minnesota. At that point you could wade ankle deep across the Mississippi. 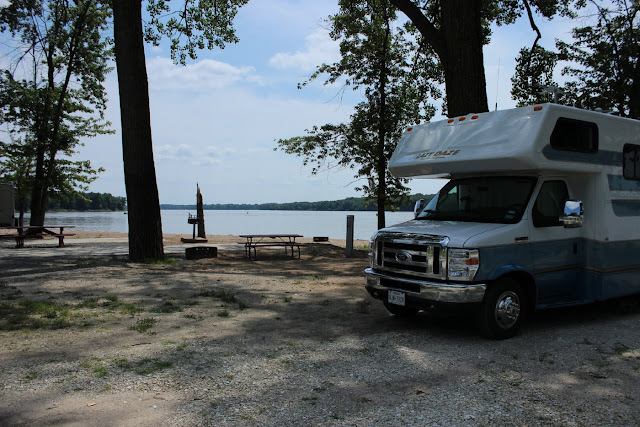 One of our favorite campgrounds is Tom Sawyer in West Memphis, Arkansas where we were right on the edge of the Mississippi and could watch barge after barge go up and down the river when it was quite high and quite low. We also visited a plantation in Louisiana where a paddle wheeler pulled up to the dock with tourists. Now, here we are camped out on the Mississippi in Illinois. And actually, we were surprised to see the tug, one of many, pushing about 15 barges.three across, up the river. 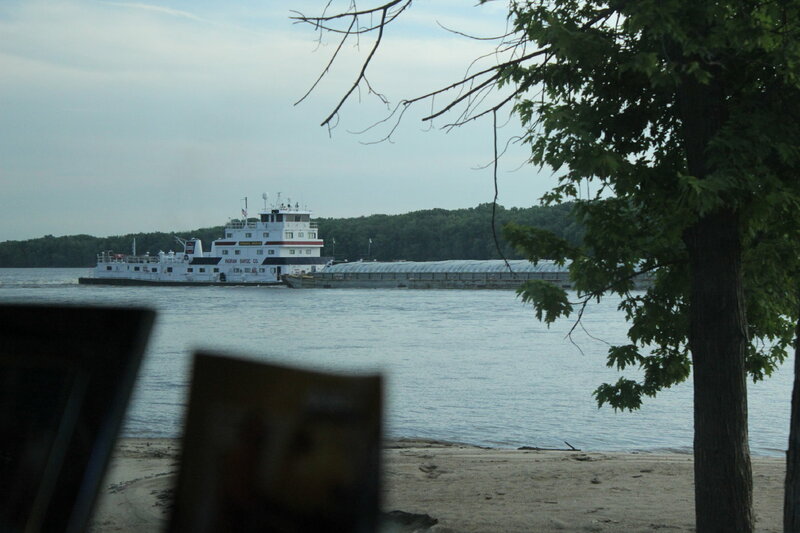 The view of the barge is from Lady Blue's back window. 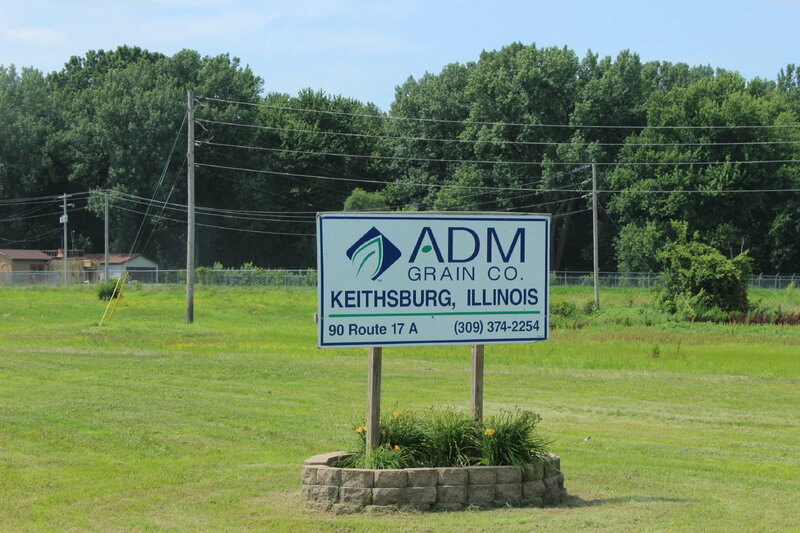 This campground is in Keithsburg, Illinois. 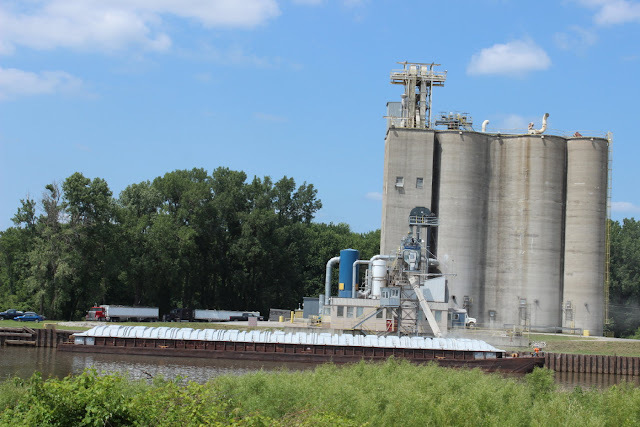 Just a short walk north of the campground is this loading dock for grains. 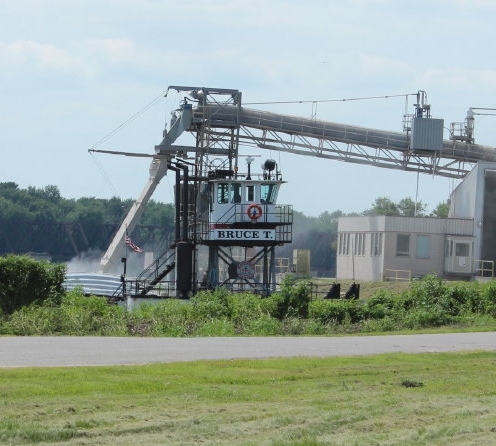 The trucks are lined up and the tower is in the process of filling a barge. Couldn't help notice the name of the tugboat! The town of Keithsburg is on a quiet state road that parallels the Mississippi. It was most populated probably in the later 1800's when business on the river was at its height. In spite of the change today, there are signs of some renovation in town. The campground itself is extremely popular on the weekend with boaters and fishermen. 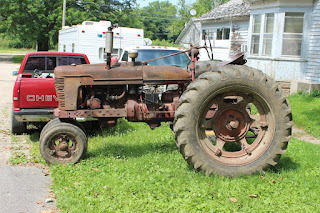 There was no identification on the tractor. It is still working, but all the labels have rusted off. I'm guessing from the 1950's or 60's? 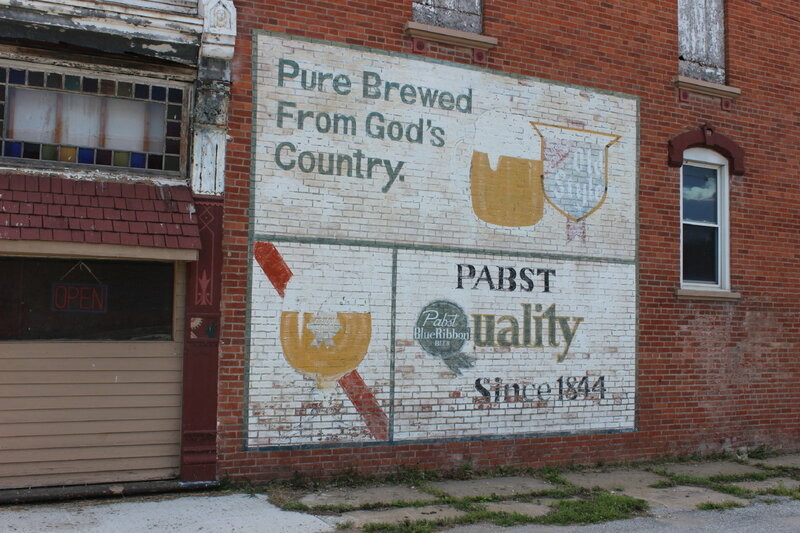 Just had to include the Pabst ad on the side of an abandoned building. 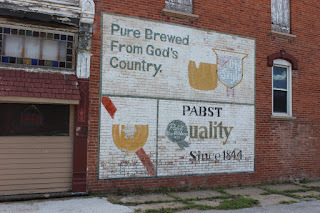 We just don't remember Pabst being brewed from "God's Country".